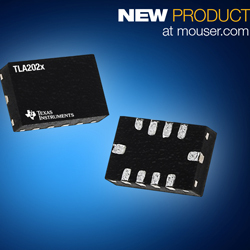 Mouser now stocks the 12-bit TLA202x delta-sigma ADCs from Texas Instruments. Drawing currents as low as 150µA, the highly integrated ADCs are intended for system-monitoring applications including supply or battery voltage supervision, current sensing, and temperature measurements. The ADCs consist of the TLA2021, TLA2022, and TLA2024 devices. The TLA2021 and TLA2022 devices are single-channel ADCs, while the TLA2024 offers two differential or four single-ended inputs through a flexible input MUX, providing an industry-high channel density of 0.75mm2 per channel. All the ADCs combine a voltage reference and oscillator; also, the TLA2022 and TLA2024 have a PGA with selectable input ranges from ±256mV to ±6.144V, enabling both large and small-signal measurements. The ADCs offer programmable data rates from 128SPS to 3.3 KSPS and provide two conversion modes: single-shot or continuous. The ADCs’ I2C-compatible interface supports I2C bus speeds up to 400kbps and a single address pin. The 1.5mm x 2mm X2QFN devices run from a wide supply range of 2V to 5.5V over a temperature range of -40C to 85C.